Italian Pope. Chosen Sumo Pontiff on the eve of the second world war, he/she was energetic defender of peace and of international institutions, by what was called "the Pope of peace". Called Eugenio Pacelli, born in Rome in 1876. He/She was ordained priest in 1899. PhD in philosophy, theology, Canon and Civil law held various positions in the Vatican and worked as a teacher of Canon law. In 1917 was anointed Bishop and participated as Pontifical legate in the Eucharistic Congress in Buenos Aires and Budapest. Apostolic Nuncio in Munich and Berlin, during the years 1920 to 1930, went to great lengths to make the end of the first world war was negotiated. From 1930 to 1939, was Cardinal Secretary of State, so it took part in the restoration of the earthly sovereignty of the papacy on the State of the Vatican, and negotiated the concordats with Austria, Yugoslavia, Romania and Germany. On March 2, 1939, is elected Pope. 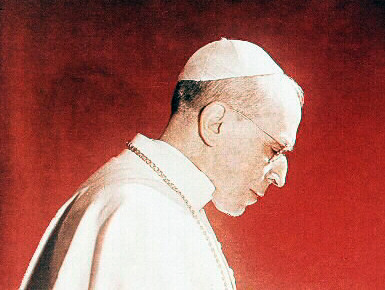 He/She devoted his first efforts as Supreme Pontiff to avoid the outbreak of the second world war, and to preach the wisdom and balance, advocating a peace based on law. However, their interventions in favour of peace did not succeed, so it tried to stop the fascist persecutions and hosted at the Vatican to persecuted of all signs. As a man open to the concerns of the era that had him live, he/she tried to more issues with authority. Causa by four North American universities was awarded the great Gold Medal of the French language, and invested doctor honoris. The essential of his pontificate acts include the proclamation of the dogma of the assumption of the Virgin, in 1950, the canonization of St. Pius X, in 1954, and the protection provided to the world the family rosary Crusade and missionary work. He published the Encyclical Mystici Corporis Christi (1943), about the doctrine of the mystical body; Divine Affolante Spiritu (1943), which gave a new impulse to the biblical studies; Mediator Dei, about the liturgical reform; and Humani generis, in which he/she declared that the theory of evolution is not in conflict with Catholic ideology. On October 9, 1958, he/she died in the papal residence of Castelgandolfo. His body was transferred to Rome and buried in the crypt of the Basilica of San Pedro. In 1965 started the canonical process for his beatification.